Are you searching for a company that can give you a new decorative finish for your worn out driveway, pool deck, or floors, with something beautiful and long lasting? Imagine working with a reputable business where you would get the best service and best products. We have our friendly staff come straight to your home or place of business to measure, show you samples, and give you a free estimate. It is important to work with people who listen to exactly what you want and help you make your vision a reality. One of the thing that sets us apart is our willingness to listen to what you want, discuss the options, then advise you on what would work best to achieve your goals. 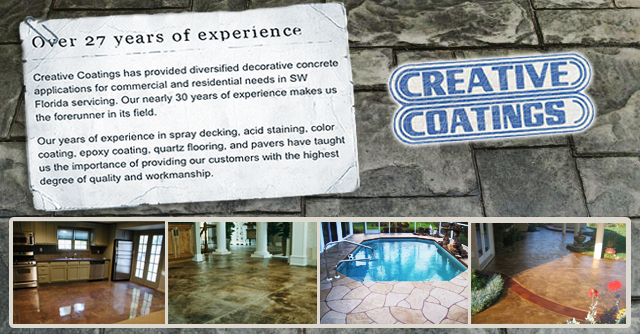 My name is Larry Benforado and I am the owner of Creative Coatings and Textures LLC and have been for 30 years. We are a family owned and operated business that services all of Southwest Florida. I believe we should treat each and every client as though we were advising a member of our own family. I also believe we should use quality materials to ensure a long lasting and beautiful finish. All of our work is done by professionals who have been a part of our team for years, and who know the materials inside and out. We are a trustworthy group who can help transform your concrete in an efficient, clean, and respectful manner. We have been doing business since 1983 and we are still here helping people from over 30 years ago. Our clients love working with our friendly and veteran staff and you will too. For a free estimate, please call our office or come down to our showroom to see samples and ask any questions you may have. (Click here for directions).